[Facsimile Image of the completion certificate for BOTH AiCore-I & AiCore-II] AiCore-I participants completing the course receive an AiCore-I course completion certificate. Register through Oct-2018 To Save while 2017 tuition rates are held over for the Fall-2018 AiFasTrak Extended WEEKEND, Live Online, Course Offerings! Registration NOW will apply those savings for you to ANY 2018-19 ONLINE offerings of these courses in any of our online formats: AiFasTrak Weekends; Twice-weekly 2½-3½-hour live sessions; or, AiCloud Self-Paced Study! BE "AiV ™ AiS" Eligible by the end of August! Then, audio-visual AiRecordings are posted in AiCloud Group & AiCandidate Folders for review or to make up missed live sessions. AiMentored study uses the latest class materials and AiRecordings of the current live sessions. Self-Study Candidates keeping pace with a parallel live sessions track, are also able to join live online sessions. AiFasTrak™ Live Online Weekend Class Thu. thru Mon. Usually at 9-12pm ET on the following Tue. To maximize Q&A-Discussion time with global participants. 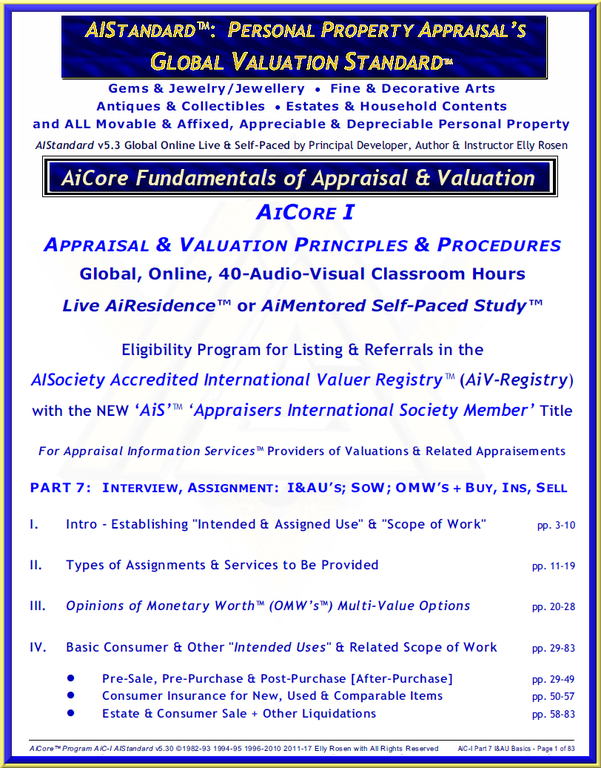 Personal Property Appraisal's 35th Anniversary Offerings of the 40-Classroom Hour AiFasTrak™ to THE Global Valuation Standard™. 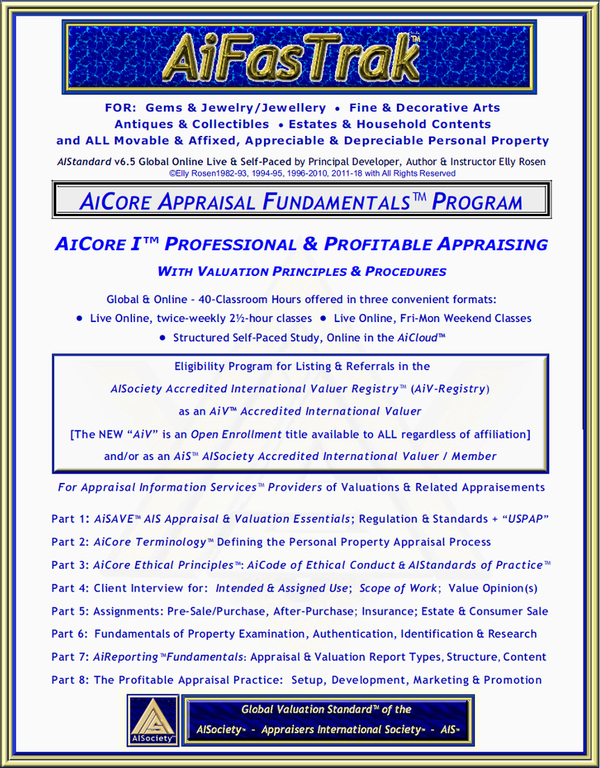 AiCertification's NEW "AiCore-I™ Professional & Profitable Appraising with Valuation Principles & Procedures"
periodic AiFasTrak™ one week and weekend live, online classes. 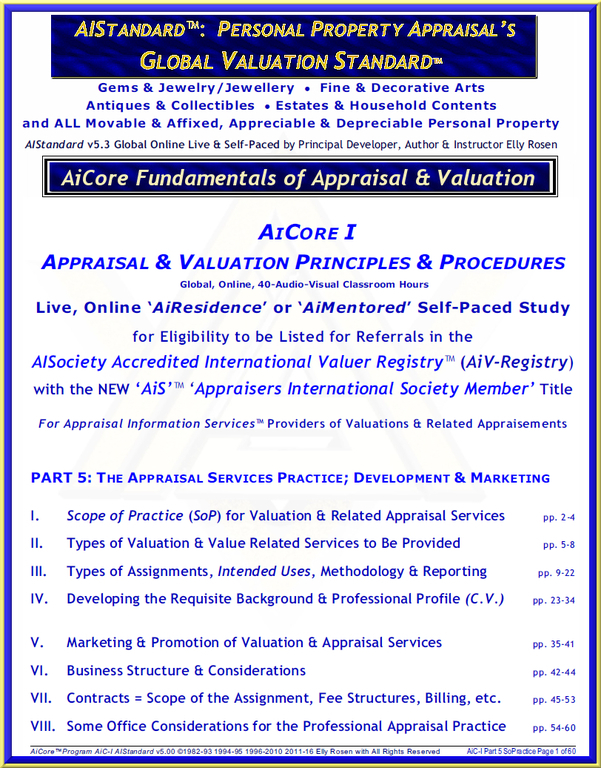 "AiS™ Appraisers International Society Accredited Member / Valuer"
NEW! Since 2017, AIS' NEW "Open Enrollment" policy makes ALL AiCertification courses available to any personal property appraiser or valuer, regardless of membership or affiliation! *Use of any and all AISociety Trade Dress, Names. 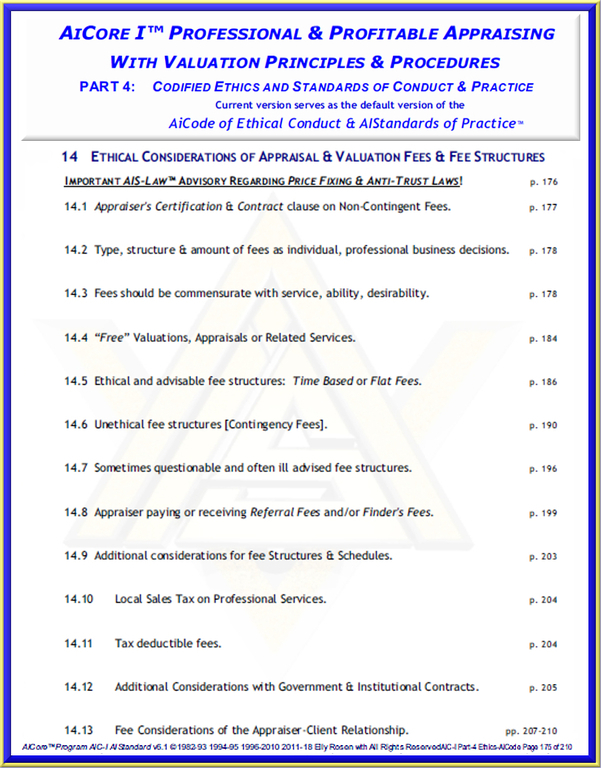 Titles, Appellations, Post-nominals, Logos and references to affiliation or membership are subject to the AISociety Terms of Service™ (AiS-ToS), The AiCode of Ethical Conduct & AIStandards of Practice™ (AiCode™) and maintenance of good standing in accordacnce with AISociety Rules, all to be determined, suspended or revoked at the sole discretion of AIS. 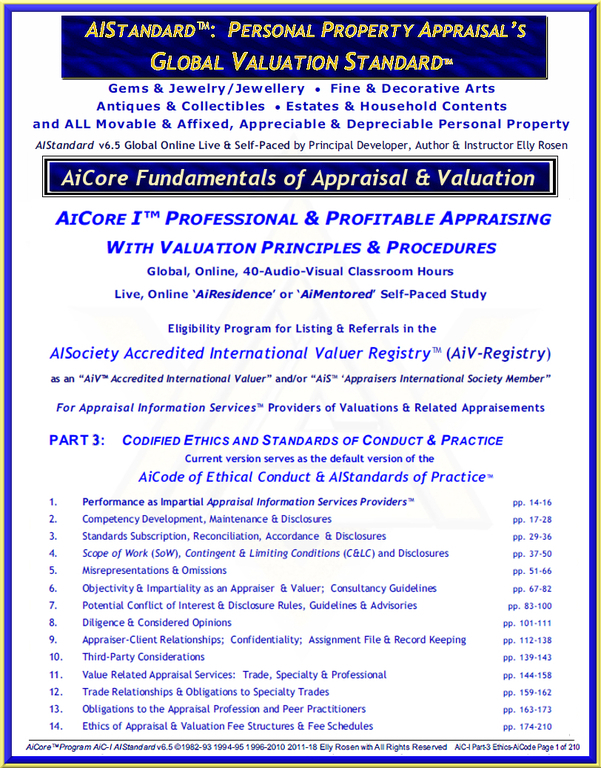 Based on Valuation Principles & Procedures! To be eligible for Accredited International Valuer Registry listing! 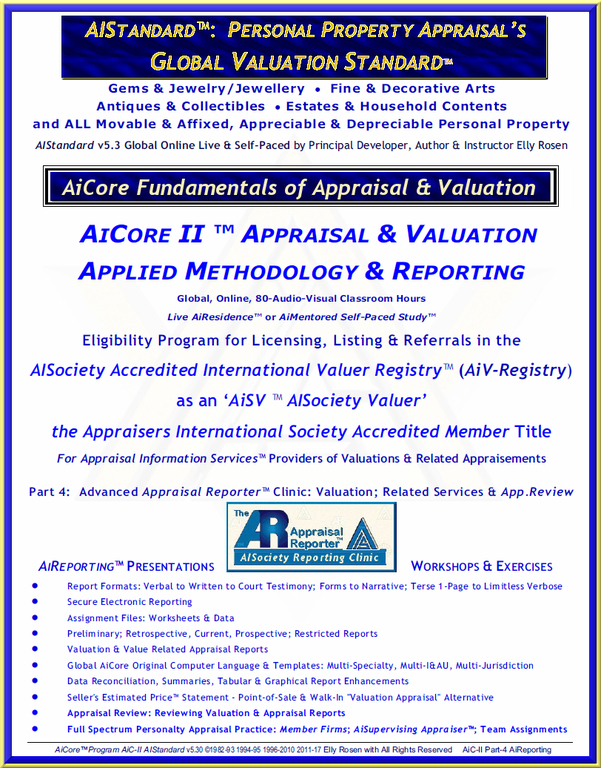 OR an "AiV" ™ Accredited International Valuer"
for AiCore-I Live twice-weekly and self-paced study offerings, made in three payments: $400 down with registration followed by $350 20-days later and $350 20-days after that. Current enrollment for any AiCertify program permits your doing so with any one of currently available formats during 2018: Live AiResidence; AiFasTrak; or AiMentored Self-Paced Study in the AiCloud. Please tell us a little about yourself, your specialty area and reason for registering with us? Questions about our education, testing and certification program? For additional information about our courses, program registration, wish to pay by credit or debit card by phone, or have any other questions, please contact us by completing our contact information form, emailing AiCertify@AISociety.com, or by calling 1+347-281-4220.